Are you in need of small point of sale cash registers for your business? At CCM Epos, we provide state-of-the-art systems that are perfect for both hospitality and retail environments. Our small point of sale cash register will help revolutionise your business making it easier for your customers to pay for a product or service and help you keep up-to-date with the changing market. With today’s continually evolving technology it is important for businesses to keep up with the latest systems in order to maintain their success within their market. At CCM Epos, we have designed a range of small point of sale cash registers to help improve the efficiency of your company’s service. We can provide a FREE consultation where we can discuss a range of bespoke features for your small point of sale cash registers, and there in no obligation to commit to purchase. You have the option to buy, rent, or lease our systems depending on what suits your business the best. Our most compact small point of sale cash registers are our Onepos systems. These tills boast many of the same features as our larger systems with the added benefit of fitting neatly into smaller retail or hospitality environments. This all-in-one systems allows for smooth running of your business and ease of use by employees. These small point of sale cash registers are a great option for smaller businesses who want to be able to keep up with the fast transaction process customers expect today. If you own a café or takeaway restaurant, opting for a small point of sale cash register won’t take up space as you don’t need a full cash register. The Onepos Epos system comes with all of the necessary features to keep your business running smoothly, including a built-in receipt printer, card reader and PCT screen. The list of customisable features is endless, and we can ensure your small point of sale cash register does exactly what you need it to. Just a few of the extra features we can add include wall mounting, product sales reports, discounts and receipt reprints. All of these things help you keep track of how your business is running and can manage your monthly targets so that you know what areas you may need to improve on. To see the full list of features that come with our Onepos small point of sale cash registers, click here. One of the most useful features of our small point of sale cash registers is their comprehensive stock control and sales data. When you are managing a commercial or hospitality business it is important that you are kept up-to-date with all the necessary statistics so that you can continue to improve. Your small point of sale cash register will have TouchOffice incorporated into its system which allows you to effectively manage your day-to-day sales and stock. You’ll get a complete overview of your PoS Systems so that you can see exactly what products you’re selling and what you may need to do differently within the company. Our small point of sale cash registers are designed to put you one step ahead of your competitors by allowing you to make changes to stock, prices and add new products when necessary. The easy-to-navigate software means that it has never been easier to manage business demands and implement new strategies at the touch of a button. The system will automatically collate all of the data from your small point of sale cash registers at the end of each day or shift for a clear understanding of your sales patterns. You can have access to this software both on or offsite so that you can be in control of your business no matter where you are. To find out more about the TouchOffice software, click here. The staff and technical support at CCM Epos are dedicated to providing cost-effective and reliable solutions for your business’ needs. Whether you are looking for a small point of sale cash register or one of our fully comprehensive systems, we guarantee you’ll wish you’d upgraded sooner. 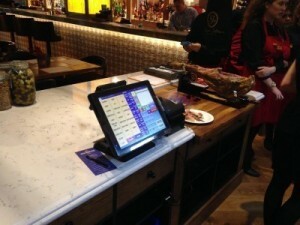 Each of our Epos systems is designed for ease-of-use, meaning our intuitive interfaces require minimal staff training. Should you ever have any queries about the functioning of your small point of sale cash registers, CCM Epos are on hand to guide you through it. Not only are we available for telephone support, but we will check-in with you every 6 months to ensure your small point of sale cash registers are running smoothly. As well as our small point of sale cash registers, we also offer full retail Epos systems that would be suitable for supermarket checkouts and other larger retailers. You may also wish to opt for the larger version of our hospitality Epos systems which work extremely well for managing larger and busier bar and restaurant environments. If you’re still unsure if a small point of sale cash register is right for your business, get in touch with our friendly team and book a consultation to discuss your options. We endeavour to provide you honest and impartial advice so that you can make a well-informed decision that suits your budget and requirements. For the most reliable small point of sale cash registers for your business, get in touch with CCM Epos today. Call us on 01202 302666 or email us at info@ccmepos.com.